Penguin Vacation is a 5 reel and 20 payline online slot game brought to you by the software developers at Playtech. The game is set in the Arctic where a family of penguins enjoy a vacation together. The graphics are crisp and clear, filled with Arctic and vacation related displays. The icy blue colour palette creates a feeling of calm as you spin the reels. The game is specifically designed for PC play, although works seamlessly on both iOS and Android devices. The graphics are expertly designed and much thought has gone into the overall look and feel of the game, which is set in a whimsical rose garden. Players can expect to see all their favourite 'Alice in Wonderland' characters amongst the reels. 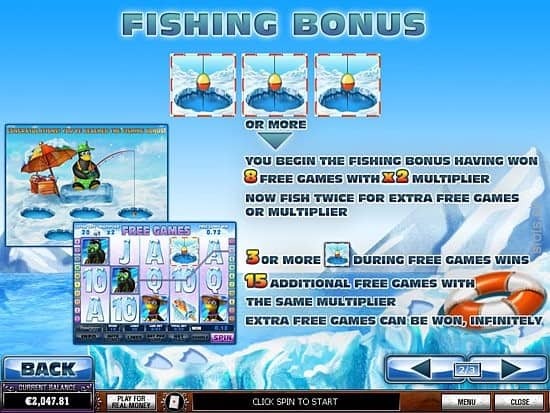 Penguin vacation, on top of having a Wild and Scatter, has an exciting bonus feature that enhances the gameplay to increase winning possibilities. The game's main bonus feature is called the Fishing Bonus. This bonus round is activated when players land 3 or more of the Scatter symbols, which is an icon of a fishing hole in the ice. Here you will instantly win 8 free spins as well as 2x multiplier upon entering the bonus round. Next, you will be taken to a screen where a penguin is fishing from 5 holes in the ice. In the Fishing Bonus round, you will have the opportunity to add to the rewards by choosing 2 holes for the penguin to fish from. 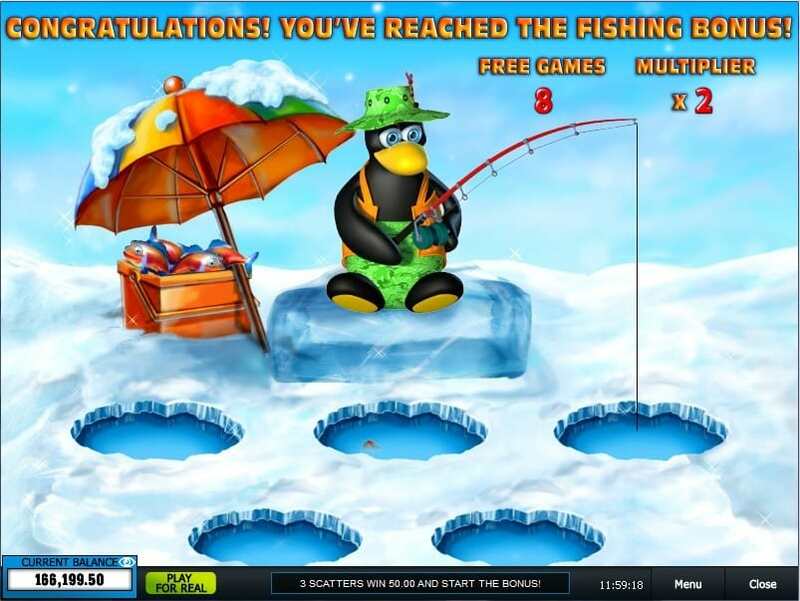 In these holes, the penguins could fish out additional free spins and multipliers. The maximum free spins available are 33, while the maximum multiplier that can be caught is 15x. If 3 or more scatters appear within the free spins, an additional 15 free spins will be awarded and the multiplier will remain the same. Free spins can be won indefinitely within the free spin games. Penguin Vacation is a 5 reel and 20 payline game with a variety of card and Arctic vacation-themed symbols. These symbols include both a Wild symbol and a Scatter symbol. Both the Scatter and Wild symbol have special features to enhance the game. The Wild symbol is an icon of a penguin sliding down a sheet of ice. It can replace any of the game's symbols except for the scatter, which greatly increases the chances of landing winning combinations. The Wilds are stacked on all reels and are also worth 1000x your bet if you happen to land 5 on an active payline. The scatter symbol is that of the fishing hole in the ice. Landing 3 of these scatter symbols will award you with 8 free spins and a 2x multiplier, as well as activate the Fishing Bonus where you will get the chance to win additional free spins and multipliers. Penguin Vacation is a crisply structured online slot game designed for both pc and mobile play. The theme is original and the game has aesthetically pleasing graphics along with an enjoyable soundtrack. The bonus round is easy to understand and has the opportunity to award a great amount of spins with a large multiplier. This is another sound slot game from Playtech.